This crumpled up piece of paper was salvaged by Carl somewhere along the line. 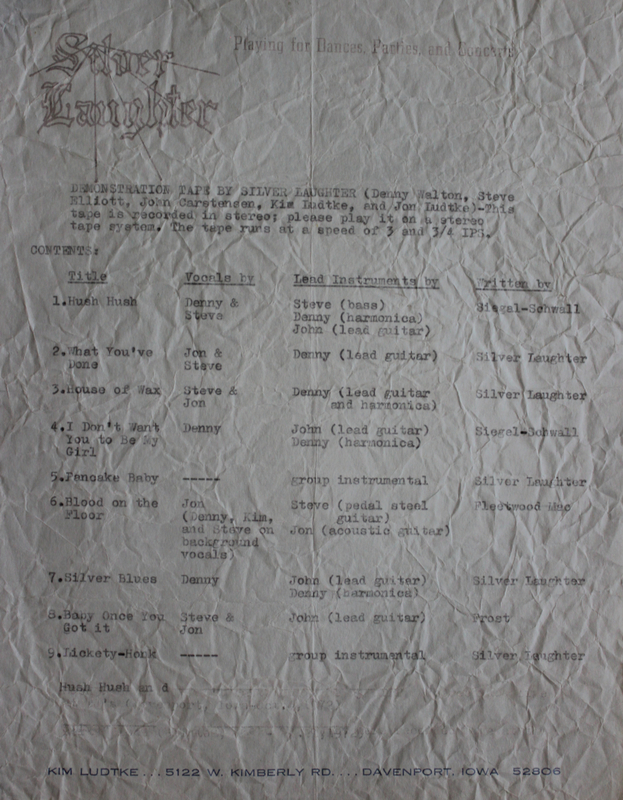 The document shows an early list of songs meant to accompany a tape that promoted the band back in the early ’70’s. It was done at a time when Silver Laughter was a five piece group consisting of Jon and Kim Ludtke, Steve Elliott, John Carstensen, and Denny Walton. It looks like the tape was a reel to reel since the verbiage claims it should be run at 3 & 3/4 inches per second indicating a variable speed unit. As you can read, there were a lot of Silver Laughter originals on that one. I sure wish I had that tape today!